Built on a slope, with magnificent views of the endless deep blue Aegean sea. The main buildings and the accessible rooms are located at the bottom of the slope whilst the 330 rooms are built on the hillside. Aegean Village caters for a wide variety of needs for all age groups. 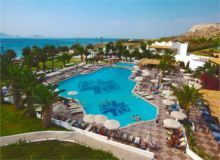 The Labranda Marine Aquapark Resort is the perfect holiday spot for a Greek island family vacation. The hotel offers a variety of fantastic family-friendly facilities including a fun Water Park, exclusive to guests of this property.